After his demotion Shevardnadze endured several years of obscurity before returning to attention as a First Secretary of a city district in Tbilisi. Shevardnadze challenged Tbilisi First Secretary Otari Lolashvili, and later charged him with corruption. Shevardnadze left party work after his appointment as First Deputy of the Ministry of Internal Affairs of the Georgian SSR in 1964. It was his successful attempt at gaolling Lolashvili, which got him promoted to the post of First Deputyship. In 1965, Shevardnadze was appointed Minister of Internal Affairs of the Georgian SSR. After initiating a successful anti-corruption campaign supported by the Soviet government, Shevardnadze was voted as Second Secretary of the Georgian Communist Party. Shevardnadze's anti-corruption campaign increased public enmity against him. However, these campaigns garnered the interest of the Soviet government, and in turn, his promotion to the First Secretaryship after Vasil Mzhavanadze's resignation. In 1951, Shevardnadze married Nanuli Shevardnadze, whose father was killed by the authorities at the height of the purge. At first Nanuli rejected Shevardnadze's marriage proposal, fearing that her family background would ruin Shevardnadze's party career. These fears were well justified; many other couples lost their lives for the same reason.Between July 25, 1972, and September 29, 1972, Shevardnadze served the First secretary of the Tbilisi City Committee of the Communist Party of Georgia. Shevardnadze's rapid rise in Soviet Georgia's political hierarchy was the result of his campaign against corruption. Throughout most of Shevardnadze's leadership, anti-corruption campaigns were central to his authority and policy. By the time Shevardnadze had become leader, Georgia was the Soviet republic most afflicted by corruption. The rule of Vasil Mzhavanadze had been characterised by weak leadership, nepotism, despotism, and bribery pervading the upper echelons of power. In Georgia, corruption had been allowed to thrive, leading to serious deformations in the system; for example only 68 per cent of Georgian goods were exported legally, while the percentage of goods exported legally from other Soviet Republics approached 100 per cent. Shevardnadze rallied support for his anti-corruption campaigns by establishing the Study of Public Opinion. To combat corruption, he engaged in subterfuge; after halting all exports he dressed himself as a peasant and drove a car filled with tomatoes through the border. After his personal subterfuge, the entire Georgian border police was purged. While never proven, it is said that after taking office, Shevardnadze asked all leading officials to show their left hands and ordered those who used Western-produced watches to replace them with Soviet ones. This story portrayed Shevardnadze as an active battler against corruption. His campaign against corruption was largely unsuccessful and when he returned to Georgia in 1992, corruption was still a huge problem. Previous Soviet Georgian rulers had given in to nationalist favouritism to the Georgians; Shevardnadze was against this policy of favouritism. Therefore, his nationalistic policy is considered controversial in Georgia. At the 25th Congress of the Georgian Communist Party, Shevardnadze told the congress, "for Georgians, the sun rises not in the east, but in the north—in Russia". Shevardnadze saw "extreme nationalism", coupled with corruption and inefficiencies within the system, as one of the main obstacles to economic growth. During his rule he condemned what he considered "national narrow-mindedness and isolation" and writers who published works with nationalistic overtones. The 1970s saw an increase in nationalistic tendencies in Georgian society. The 1978 Georgian demonstrations were sparked by the Soviet government's decision to amend the Georgian constitution and remove the Georgian language as the sole state language in the republic. While at first standing firm with the Soviet government, Shevardnadze quickly reiterated his position and was able to compromise with the Soviet government and the demonstrators. The Georgian language was kept as the sole official language of the republic and the Supreme Soviet of the Soviet Union passed legislation calling for an increasing level of Russian language training in the non-Russian republics. There was another problem facing Shevardnadze during the 1978 demonstrations; some leading Abkhaz intellectuals were writing to Leonid Brezhnev in the hope that he would let the Abkhaz Autonomous Soviet Socialist Republic secede from Georgia and merge into the Russian SFSR. To halt this development, the Georgian government gave way to concessions made by the secessionists that included establishing an Abhkaz university, the expansion of Abkhaz publications and creating an Abkhaz television station. Shevardnadze proved to be an active supporter of defending minority interests. At the 25th Congress of the Communist Party of the Soviet Union (CPSU) in 1976, Shevardnadze gave a speech in which he called General Secretary Leonid Brezhnev "vozhd" (leader), a term previously reserved for Joseph Stalin. His adulation was only surpassed by that of Andrei Kirilenko and Heydar Aliyev. As Yegor Ligachev later said, Shevardnadze never contradicted a General Secretary. During Brezhnev's last days, Shevardnadze publicly endorsed Konstantin Chernenko's candidacy for the General Secretaryship and called him a "great theoretician". However, when it became clear that the secretaryship would not go to Chernenko but to Yuri Andropov, Shevardnadze swiftly revised his position and gave his support for Andropov. Shevardnadze became the first Soviet republican head to offer his gratitude to the newly elected leader; in turn, Andropov quickly signalled his appreciation and his support for some of the reforms pioneered by Shevardnadze. 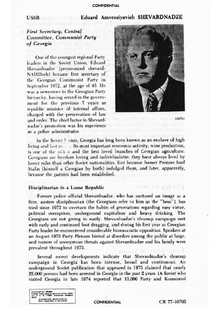 According to Andropov's biographers the anti-corruption drive he launched was inspired by Shervardnadze's Georgian anti-corruption campaign. When Andropov died, Shevardnadze again became an avid supporter of Chernenko's candidacy for the General Secretaryship. When Chernenko died, Shevardnadze became a strong supporter of Mikhail Gorbachev's leadership candidacy. Shevardnadze became a member of the Central Committee (CC) of the CPSU in 1976, and in 1978 was promoted to the rank of non-voting candidate member of the Soviet Political Bureau (Politburo). His chance came in 1985, when the veteran Soviet Minister of Foreign Affairs Andrei Gromyko left that post for the largely ceremonial position of Chairman of the Presidium of the Supreme Soviet of the Soviet Union. The de facto leader, Communist Party General Secretary Mikhail Gorbachev, appointed Shevardnadze to replace Gromyko as Minister of Foreign Affairs, thus consolidating Gorbachev's circle of relatively young reformers. The newly independent Republic of Georgia elected as its first president a leader of the national liberation movement, Zviad Gamsakhurdia—a scientist and writer who had been imprisoned by Shevardnadze's government in the late 1970s. However, Gamsakhurdia's rule ended abruptly in January 1992, when he was deposed in a bloody coup d'état. Shevardnadze was appointed Speaker of the Georgian parliament in March 1992 and as speaker of parliament in November; both of these posts were equivalent to that of president. When the presidency was restored in November 1995, he was elected with 70% of the vote. He secured a second term in April 2000 in an election that was marred by widespread claims of vote-rigging. On 2 November 2003, Georgia held a parliamentary election that was widely denounced as unfair by international election observers. The outcome sparked fury among many Georgians, leading to mass demonstrations in Tbilisi and elsewhere, called the Rose Revolution. Protesters broke into parliament on 22 November as the first session of the new Parliament was beginning, forcing President Shevardnadze to escape with his bodyguards. On 23 November, Shevardnadze met with the opposition leaders Mikheil Saakashvili and Zurab Zhvania to discuss the situation in a meeting arranged by Russian Foreign Minister Igor Ivanov. After this meeting, Shevardnadze announced his resignation, declaring that he wished to avert a bloody power struggle "so all this can end peacefully and there is no bloodshed and no casualties". Shevardnadze's resignation as President of Georgia was the end of his political career. Georgia's incumbent president Giorgi Margvelashvili and Prime Minister Irakli Garibashvili extended condolences to his family members. Margvelashvili described him as "one of the distinguished politicians of the 20th century, who participated in dismantling of the Soviet system". He added, "He was also playing a serious role in creation of new Georgia and in development of our western course". Garibashvili said Shevardnadze's "contribution was especially important in establishing Georgia’s geopolitical role in the modern world. Eduard Shevardnadze was a politician of international significance, who made a great contribution to end the Cold War and to establish new world order." Former President Mikheil Saakashvili, who overthrew Shevardnadze in the 2003 Rose Revolution, offered condolences and said Shevardnadze was "a significant figure for the Soviet empire and for post-Soviet Georgia". Saakashvili said his government did not start a criminal prosecution against Shevardnadze, despite calls by some politicians and parts of society, out of "respect to the President’s institution". Among others, Russian President Vladimir Putin and U.S. Secretary of State John Kerry offered condolences. Kerry credited Shevardnadze with playing "an instrumental role" in bringing about the end of the Cold War, a reduction of "the risk of nuclear confrontation" as the Soviet Union's Foreign Minister, ensuring "the sovereignty and territorial integrity of [Georgia] during the 1990s" as President of Georgia and putting the country "on its irreversible trajectory toward Euro-Atlantic integration". Shevardnadze was accorded a state funeral on 13 July 2014, which was attended by the Georgian political leaders and foreign dignitaries, including the former US Secretary of State James Baker and former German Foreign Minister Hans-Dietrich Genscher. After a service at the Holy Trinity Cathedral of Tbilisi, Shevardnadze was buried next to his late wife Nanuli Shevardnadze at the Krtsanisi residence in Tbilisi. ^ Ekedahl and Goodman 2001, p. 8. ^ "ШЕВАРДНАДЗЕ: БЕРИЯ УБИЛ СТАЛИНА И РАССТРЕЛЯЛ ДВОЮРОДНОГО БРАТА МОЕГО ОТЦА". 22 March 2010. Archived from the original on 6 April 2012. Retrieved 27 September 2011. ^ Suny, Ronald (1994). The Making of the Georgian Nation. Indiana University Press. pp. 328–329. ISBN 0-253-20915-3. ^ a b Ekedahl and Goodman 2001, p. 10. ^ a b Hough 1997, p. 178. ^ Ekedahl and Goodman 2001, pp. 15–16. ^ Ekedahl and Goodman 2001, pp. 10–11. ^ a b c d Ekedahl and Goodman 2001, p. 11. ^ Ekedahl and Goodman 2001, p. 12. ^ Ekedahl and Goodman 2001, pp. 11–12. ^ Ekedahl and Goodman 2001, p. 9. ^ "from 25 July, 1972, First Secretary of Tbilisi Party City Committee;". Archived from the original on 19 September 2017. ^ "Soviet Union: Southern Corruption". Time. 3 December 1973. Retrieved 12 December 2010. ^ Ekedahl and Goodman 2001, p. 19. ^ Ekedahl and Goodman 2001, pp. 19–20. ^ a b Ekedahl and Goodman 2001, p. 20. ^ Ekedahl and Goodman 2001, p. 26. ^ Ekedahl and Goodman 2001, p. 17. ^ Ekedahl and Goodman 2001, p. 18. ^ Ekedahl and Goodman 2001, pp. 18–19. ^ Ekedahl and Goodman 2001, pp. 20–21. ^ Ekedahl and Goodman 2001, p. 21. ^ Ekedahl and Goodman 2001, p. 22. ^ Ekedahl and Goodman 2001, pp. 22–23. ^ Ekedahl and Goodman 2001, p. 23. ^ Ekedahl and Goodman 2001, p. 24. ^ Ekedahl and Goodman 2001, p. 13. ^ Ekedahl and Goodman 2001, p. 14. ^ Ekedahl and Goodman 2001, pp. 14–15. ^ Ekedahl and Goodman 2001, p. 31. ^ a b c d e "Eduard Shevardnadze: Controversial legacy to Georgia". BBC. 8 July 2014. Retrieved 8 July 2014. ^ a b c d e f "Eduard Shevardnadze, Foreign Minister Under Gorbachev, Dies at 86". New York Times. 7 July 2014. Retrieved 11 July 2014. ^ a b c d e f g h i j k l "Eduard Shevardnadze - obituary". Daily Telegraph. 7 July 2014. Retrieved 11 July 2014. ^ Kolstø, Pål. Political Construction Sites: Nation-Building in Russia and the Post-Soviet States, p. 70. Westview Press, Boulder, Colorado, 2000. ^ "Eduard Shevardnadze obituary". Guardian. 7 July 2014. Retrieved 8 July 2014. ^ "Eduard Shevardnadze obituary" (7 July 2014). Guardian. Retrieved 11 July 2014. ^ "POSTSCRIPT: EDUARD SHEVARDNADZE, 1928-2014". New Yorker. 8 July 2014. Retrieved 11 July 2014. ^ "Georgian Leader Resigns Amid Peaceful Opposition Standoff". PBS. 24 November 2003. Retrieved 11 July 2014. ^ "Eduard Shevardnadze: A Soviet-Georgian life of global importance". DW. Retrieved 11 July 2014. ^ "Georgian President, PM Extend Condolences over Shevardnadze's Death". Civil Georgia. 7 July 2014. Retrieved 8 July 2014. ^ "Saakashvili Offers Condolences Over Shevardnadze's Death". Civil Georgia. 7 July 2014. Retrieved 8 July 2014. ^ "Putin Sends Condolences to Georgia over Shevardnadze's Death". Civil Georgia. 7 July 2014. Retrieved 8 July 2014. ^ "On the Passing of Former Georgian President Eduard Shevardnadze" (Press Statement). U.S. State Department. 7 July 2014. Retrieved 8 July 2014. ^ "Shevardnadze Laid to Rest in State Funeral". Civil Georgia. 13 July 2014. Retrieved 13 July 2014. ^ a b c d "Georgian ex-president Eduard Shevardnadze dies at 86". TASS. 7 July 2014. Retrieved 21 November 2017. ^ "Dostluk İlişkilerine Katkının Altın Sembolü: Devlet ve Cumhuriyet Nişanları (Turkish) - The Gold Symbol Contribution of Friendly Relations : State and Republic Orders". Haberler.com. February 2013. Retrieved 25 February 2015. ^ "Gürcüstanın Prezidenti Eduard Amrosiyeviç Şevardnadzenin "İstiqlal" ordeni ilə təltif edilməsi haqqında AZƏRBAYCAN RESPUBLİKASI PREZİDENTİNİN FƏRMANI" [Order of the President of Azerbaijan Republic on awarding President of Georgia Eduard Shevarnadze with Istiglal Order]. Archived from the original on 20 November 2011. Retrieved 20 January 2011. Hough, Jerry F. (1997). Democratization and revolution in the USSR, 1985-1991. Brookings Institution Press. ISBN 0-8157-3748-3.